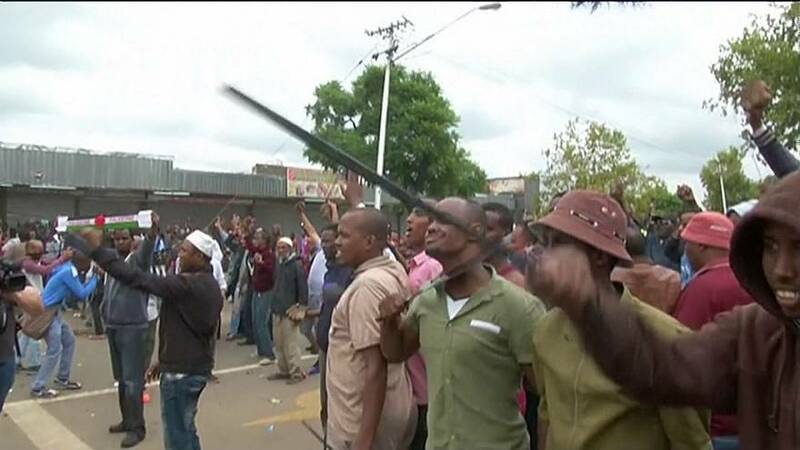 Violent clashes have erupted between locals and migrants in the South African capital, Pretoria. Police fired tear gas, stun grenades, rubber bullets and water cannon to disperse rival marches by hundreds of citizens and non-nationals. The unrest in Pretoria comes after stores belonging to migrants were looted. It broke out despite a condemnation of anti-foreigner violence and call for calm from President Jacob Zuma. “It is wrong to brand all non-nationals as drug dealers or human traffickers,” Zuma said. The protesters tried to march toward the foreign ministry. Some were carrying sticks and pipes. Police tried to keep them apart from foreign migrants, who had gathered to protest about recent attacks. Armed police had formed a barrier between citizens and non-national marches. However, the crowds became unruly. The marches follow the looting earlier this week of at least 20 small businesses believed to belong to Nigerian and Pakistani immigrants in an area in west Pretoria. Residents say the shops were attacked because they were dens of prostitution and drug dealing. Resentment against foreigners has sometimes turned deadly in South Africa. The fear is they are taking jobs from locals in a country where unemployment is above 25 percent. Others are blamed for drug-dealing and other crimes. Despite its high unemployment, South Africa is one of the continent’s largest economies. It remains a draw for people from far more impoverished nations across the continent.